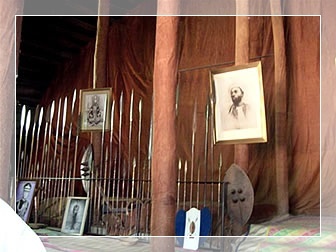 Situated about 12km from central Kampala along the Jinja Road, Namugongo, an established place of execution in pre-colonial Buganda, is remembered today for the massacre that took place there on 3 June 1886 at the order of Kabaka Mwanga. In the last week of May, an unknown number of Baganda men and women suspected or known to have been baptised were detained near Mengo and forced to march, by some accounts naked, to Namugongo, where they were imprisoned for several days while a large pyre was prepared. On the morning of 3 June, those prisoners who had not already done so were given one final opportunity to renounce their recently adopted faith. Whether any of the neophyte Christians accepted this offer goes unrecorded, but 26 known individuals, divided evenly between Catholic and protestant, declined. Charles Lwanga, the leader of the Catholic contingent, was hacked apart and burnt alive on the spot. Later in the day, the remaining individuals were bound in reed mats, thrown onto the pyre, and roasted alive. The 26 remembered victims of the ‘massacre were all baptised , and thus known to one or other mission by name, but contemporary reports indicate that more than 30 people were thrown onto the fire. In 1920, Pope Benedict XV paved the way for future canonisation by declaring blessed the 13 known Catholic martyrs at Namugongo, together with another nine Catholic victims of separate killings in May 1886. The 22 Catholic martyrs were finally canonised by Pope Paul VI on 18 October 1964 during the Vatican II conference, In July 1969, Pope Paul VI visited Uganda- the first reigning pope to set foot in sub-Saharan Africa- to make a pilgrimage to Namugongo. 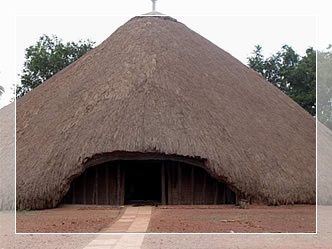 Where he instructed that a shrine and church be built on the spot where Lwanga had been killed. The Church of the Namugongo Martyrs, dedicated in 1975 and subsequently named a basilica church, is an unusual and imposing structure, modernistic and metallic in appearance, but based on the traditional Kasiisira style. The site of the massacre was visited by Archbishop Robert Runcie of Canterbury in 1984, and by Pope John Paul II in 1993. The 3 June massacre remains a public Holiday in Uganda and is marked worldwide on the Church calendar in honor of the Uganda Martyrs.